Those of you studying differential Calculus will have already met up with limits, and you've probably scratched a furrow or two into your scalp while battling to understand just what a limit means. Well, the title says it all. When we evaluate a limit such as the limit as x approaches a for f(x), we are looking for a y value. And of course, since f(x) is just an alias for y, when we find the limit as x approaches -2, say for , we are investigating what happens to the y-value on the curve at the point where x approaches -2. The operational word here is approaches!! Since division by 0 is undefined in our number system, and when x = -2 , the value -2 is not an element in the domain set of f. This is why we take a limit -- from the left and the right -- investigating the y values associated with x values close to -2. For the current function, we would have to split the limit into two separate limits. Let's look at a more interesting function. It is obvious that x = 3 is not an element of this function's domain so let's find the limit at 3. As you probably learned in your first limits lesson, generally with a fraction such as this, we factor, cancel and substitute -- but we have a value of x that makes both numerator and denomiator equal to zero here. This is known as an indeterminate form since could satisfy 3 different situations in our number system. It is a fraction with numerator = 0 so it should = 0. It is also a fraction with a denominator of 0, so it should = º. We could also assign the value 1 to this fraction by claiming that it has numerator = to denominator. Now do you understand why we call it indeterminate? Because of the nature of zero, we have to find sneaky ways to evaluate such a fraction. The other problem child from this family you'll meet is the indeterminate form of , which could also be explained to be 1, 0 or º . A French fellow named l'Hopital appropriately enough will take care of both indeterminate forms later in this course or early in the next. Until then, use algebraic techniques to find their limits. When x = -3, only the denominator = 0 here and so x = -3 is a vertical asymptote of this function. But what about x = 3?? It makes both numerator and denominator equal to 0 and so it creates a hole in the graph. We know that the x-value of the hole is 3, but what is the y-value? It is found by taking the limit of f(x) as x approaches 3. When we factor, cancel and substitute 3 for x, we get 1/6, thus the hole in this curve occurs at the point (3, 1/6). By the way, should you be asked to graph this function, you could graph the function , and then insert a hole at the point (3, 1/6). This hole is known as a removable discontinuity or a removable jump since there is only a single point missing. Thus, we could make this function continuous at x = 3 by stipulating that f(3) = 1/6. 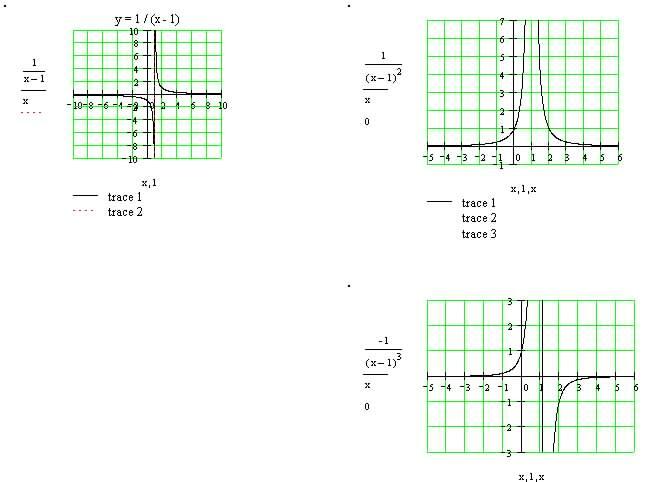 The discontinuity that occurs at x = -3 however is an infinite discontinuity otherwise known as a vertical asymptote. There is no way to fill the gap created here. When we investigate limits at infinity, we are looking at the behavior of the y-values at the extremes of x, in other words -- how does the graph behave when x approaches | infinity |. Generally, if we have a rational function (a fraction), to find the limit as x approaches infinity, we divide every term of the fraction by the highest power of x in the fraction and then set x equal to infinity. Of course, anything divided by infinity = 0, so terms that have any power of x in their denominator will = 0 and have no effect on the resulting limit. For example: if , we divide everything by x2. Once you begin studying derivatives, you will encounter a special limit known as Newton's Quotient (which should really be known as Descartes' Quotient) that will enable you to evaluate the slope of the tangent at any point along a given curve. I will discuss this topic in my next article. P.S. If you're wondering why we call fractions rational numbers you need only look at the first 5 letters of the word rational to comprehend the logic.